I cook. I eat. And always on the hunt for any activity that involves food. Oh, and I have to workout to compensate. There was a time when I used to find myself doing a regular fridge cleanout, emptying out my produce drawer of fruits and veggies that had not been consumed in time, throwing away molding bread and pouring expired milk cartons down the kitchen drain. I would go to the farmers market and buy all sorts of interesting fruits and veggies that would appeal to me, and then I would go to the grocery store on a weekly basis and buy all my “staples”. It gave me great pleasure to see my bountiful refrigerator until I had to open up the trash can for the cleanout. I knew something had to change. The first thing that caused me to change my behaviour was joining a CSA. I signed up for the “6 items a week” box which provided me with enough variety for the week that I didn’t need to go to the farmers market as regularly. I shifted gears into coming up with creative ways to cook what had come in my delivery box. This also helped me realize that I had become almost robotic with my weekly grocery shopping (picking up tomatoes because everyone needs tomatoes, grabbing apples because your fruit drawer should always have apples in it) instead of focusing on buying the best products to create meal plans out of. The second thing that made an impact on my behaviour was reading Barbara Kingsolver’s Animal, Vegetable, Miracle. Reading this book gave me an appreciation for eating locally and looking for produce during its growing season as opposed to looking for tomatoes in the dead of winter. Produce always tastes the best during its growing season, and I’m fortunate to live in California where I’m surrounded by some of the best farms. 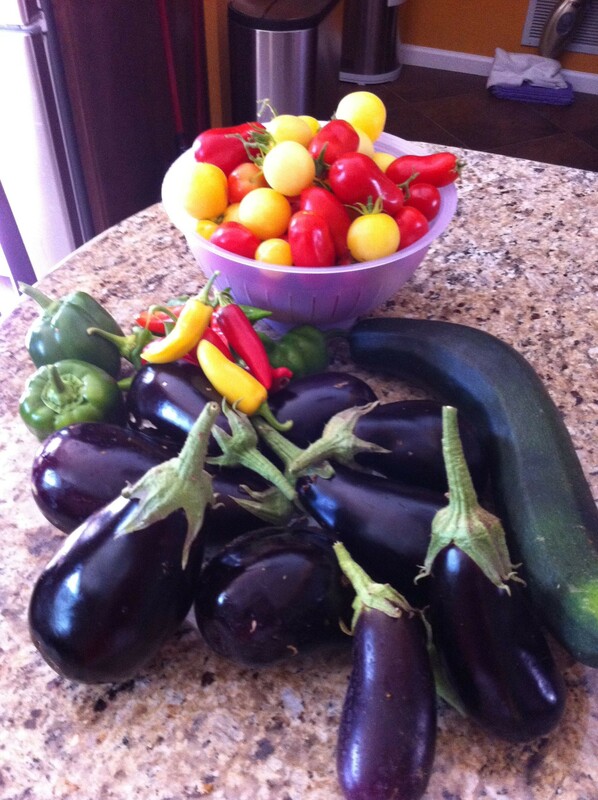 The third thing was the growth of our own backyard garden. We had an abundance of eggplants and peppers last year, so I was always coming up with creative recipes for these. I found myself going to the farmers market for fruit only because we had such an abundance of our own crops. Now, I find myself shopping at various places, looking for the freshest ingredients. I continue to receive my CSA delivery, but focus on using the delivery to try unique, new items. I still go to the farmers market regularly, but use it to pick up in-season produce, pantry staples such as garlic, onions and potatoes and whatever fruits are in season. Costco and Target keep my pantry stocked and my local grocery stores fulfill my bakery and dairy/cheese needs (although that is minimal during my April vegan experiment). Lately, I’ve been buying some of my pantry staples through Amazon, now that we’ve subscribed to Prime shipping. Here’s a list of some of my pantry staples that I always keep on hand – by staying well stocked, I resist the temptation to order take-out because I always have enough ingredients to throw together a quick, healthy meal. I supplement these with fresh produce and other perishables every week.